Moana Inspired Headpiece. Perfect For Children & Adult Too. Beach Wedding, Birthday Party, Luau, Costumes Or Gift For Your Children. 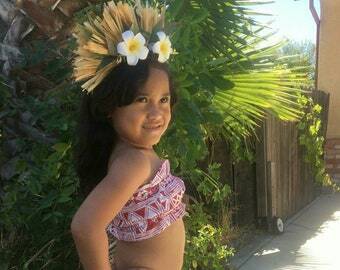 This is a sample of one of our Moana inspired headpieces. Please allow 2 weeks production time for this item. If you need It sooner, we do offer a rush fee. This does not substitute expedited shipping costs. All costumes are made to order! 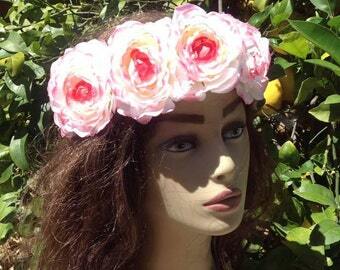 There are 2" - 2.5"x 5 flowers on the headpiece. HALF HEADPIECE/HAKU- Around behind ears , up to 15" inches around of braided silk green leaf. FULL HEADPIECE/HAKU. Around ears or 21" inches of braided silk green leaf. FOR CHILDREN IF YOU WANT, PLEASE MEASURE THEIR HEAD SIZE IF YOU ARE NOT SURE. Note- The length of the leaves, come only to the back of your ears or if like it full, please select full. The remainder of the headpiece is braided raffia, which allows you to tie the headpiece at the back of your head. We make the length of the headpiece as one size fits all. You can adjust and cut the excess raffia to fit your head or leave it the length it is. Whichever you prefer. OPTIONS- We can change the flowers to any of those listing colors, please let me know if you want to change it. This listing is for a raffia braid, if you would prefer a fabric braid please contact me before placing your order. solid red - RED IS NOT AVAILABLE RIGHT NOW. Please let me know if you need more than what I have listed! Photo Credit to - Princess Party Events. Tahitian And Cook Islands Costume Set. 1 Pair Of Lauhala Wrist Bands, Arm Bands Or Ankle Bands. Perfect For Both Male & Female Of All Ages!! 4 Pieces Or 2 Pairs Of Silk Ti Leaf Wristbands & Anklebands For Hawaiian, Polynesian, Hula Dancers, Wedding Party, Beach Accessories!! Tahitian And Cook Island Adult Grass Skirt Band..Great For Hip Hei Band Or To Use As Tahitian, Hawaiian, Cook Island Malo Band. Any Color!!! 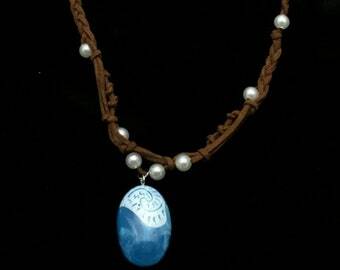 Moana Inspired Necklace Pendant, Heart of Te Fiti. 1 Necklace only. Perfect For Luau, Birthday Party, Wedding. READY TO SHIP! A wonderful addition to my Moana costume. Tahitian And Cook Island Hau Grass I'i's Or Hand Tassels. Choose Any Color..Perfect For Dancers!! Cook Islands/Rarotongan & Tahitian Set. Perfect For Children, Adult Dancers. Soloist, Luau, Halau. AUTHENTIC Tapa Cloth Headpiece. Perfect For Tahitian & Rarotongan/Cook Islands Tane/Boys and Girls. Perfect For Dancers Of All Ages, Luau!! Authentic Lo'akau/hala leaves, pulu/coconut fiber, ngatu/tapa cloth & fresh water pearl hair clip. Toddlers Top , Flower & Sarong. Moana Inspired Set. Perfect For Baby And Toddlers.